Tesla is up roughly 2% in trading Wednesday ahead of its fourth-quarter earnings report. The company has established a trend of missing earnings and delivery expectations. 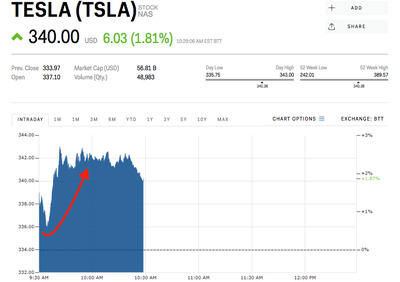 Shares of Tesla are up about 2% in early trading Wednesday after CEO Elon Musk’s other company, SpaceX, successfully launched a Roadster on it’s Falcon Heavy rocket Tuesday afternoon. The company will also report earnings for the fourth quarter after the closing bell Wednesday. Wall Street analysts expect Tesla to post an adjusted loss of $US3.16 per share, on revenue of $US3.28 billion, according to Bloomberg data. Tesla has historically missed key production deadlines, delivering just half of the cars analysts expected last month, yet its stock price continues to climb. In January, CNBC reported production of Tesla’s Model 3 sedan could be even more delayed thanks to an ongoing battery assembly issue. The automaker denied the reports. Wall Street price targets for Tesla vary widely, with the consensus coming in at $US314 – 9% above where the stock was trading Wednesday morning. Investors on the trading app Robinhood, most of which are millennials, are much more bearish on Tesla than Nomura.